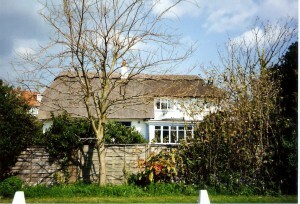 Apartment block to replace thatched cottage in Ferring? ‘There will be very strong resistance to this application’, said David Bettiss, Chairman of Ferring Conservation Group. ‘We have 900 members and we shall be encouraging every one of them to send in objections to Arun District Council. It is an outrage – we knew there was a plan already for four chalet bungalows and we were having to get used to that idea but ten apartments, in a block that covers the whole site, is really gross overdevelopment and shows no regard for the character of Ferring. This area was built in the 1920s and 1930s in a low density arrangement of bungalows and small houses on large plots. A modern apartment block would be completely out of place’. Ed Miller, Secretary of Ferring History Group, added, ‘The cottage is not quite as old as some people think but it was one of the first houses built in the development of the 1920s. Its shape and thatched roof earned it the nickname of ‘The Beehive’ and Beehive Lane – the road connecting the inter-war estate to Sea Lane, was named after it in 1928. The house is a dominant feature in one of the earliest photographs of South Ferring, and has been the centrepiece of many postcards. It’s bad enough that we should lose the cottage but to have it replaced by an apartment block is really too much. Our members will certainly fight this application’. If you agree that this is an unwelcome and unwanted development in the village, you can object to Arun District Council. Their website is www.arun.gov.uk and the reference number of the application by Globe Estates is FG/116/15 – you can view the plans there. Put in your own words why you don’t want this addition to the landscape of Ferring in the comments section of the application.